Ion homeostasis is essential for every cell and aberrant cation homeostasis is related to diseases like Alzheimer’s disease and epilepsy. The mechanisms responsible for cation homeostasis are only partly understood. The yeast Saccharomyces cerevisiae is an excellent organism to study fundamental aspects of cation homeostasis. In this study we investigated the transcriptional response of this yeast to potassium starvation by using Serial Analysis of Gene Expression (SAGE)-tag sequencing. 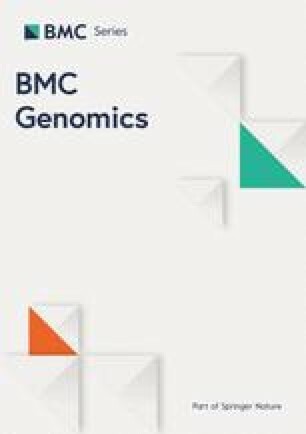 Comparison of transcript levels in cells grown for 60 min in media without potassium with those in cells grown under standard potassium concentrations showed that the mRNA levels of 105 genes were significantly (P < 0.01) up-regulated more than 2.0-fold during potassium starvation and the mRNA levels of 172 genes significantly down-regulated. These genes belong to several functional categories. Genes involved in stress response including HSP30, YRO2 and TPO2 and phosphate metabolism including PHO84, PHO5 and SPL2 were highly up-regulated. Analysis of the promoter of PHO84 encoding a high affinity phosphate transporter, revealed that increased PHO84 RNA levels are caused by both increased Pho4-dependent transcription and decreased RNA turnover. In the latter process antisense transcription may be involved. Many genes involved in cell cycle control, and to a lesser extent genes involved in amino acid transport, were strongly down-regulated. Our study showed that yeast cells respond to potassium starvation in a complex way and reveals a direct link between potassium homeostasis and phosphate metabolism. The online version of this article (doi: 10.1186/1471-2164-15-1040) contains supplementary material, which is available to authorized users. Cation homeostasis is an indispensable process for every living cell. The intracellular concentration of H+, K+ and Na+ cations must be tightly regulated because H+ and K+ are involved in important processes and activities of many cellular systems. On the other hand, extreme Na+ concentrations are toxic for cells. Aberrant cellular cation homeostasis is related to human neurological diseases like Alzheimer’s disease [1, 2] and epilepsy . Furthermore, cation homeostasis is critically important for apoptosis  and aberrant serum potassium levels are related to diseases like hypo- and hyperkalemia and Crohn's disease. Properties of ion homeostasis in plants determine their ability to grow in environments with very low or high concentrations of salts (for review see: ). The yeast Saccharomyces cerevisiae is an excellent model organism to study cation homeostasis (for reviews see: [6, 7, 8]). In this yeast intracellular potassium concentration is relatively stable at 200 – 300 mM. On the other hand, the intracellular Na+ concentration is an order of magnitude lower, around 20 mM. Maintenance of high intracellular concentrations of potassium is facilitated by the generation of a membrane potential by the proton ATPase Pma1  and two high affinity potassium transporters Trk1 and Trk2 [10, 11]. Sodium ions are mainly extruded by the Ena1-5 ATP-dependent sodium-potassium transporters [12, 13]. Potassium is extruded from the cells by the Nha1 and Tok1 transporters [14, 15]. The activity of these transporters is highly regulated by several protein kinases and protein phosphatases and by protein turnover. Regulation of ion homeostasis at the transcriptional level is less well understood. Genome-wide studies mainly addressed the transcriptional response to high sodium- or potassium levels rather than the response to cation starvation conditions [16, 17, 18, 19]. To further understand cation homeostasis in S. cerevisiae a number of European research groups including ours collaborate in the Translucent consortium . To allow studies on the response of yeast to different concentrations of potassium, a new YNB medium containing negligible concentrations of alkali metal cations has been developed by the consortium . In a recent study this medium was used to study the short-term response to potassium starvation at the transcriptional level using DNA microarrays . This study showed that the lack of potassium drastically activates sulfur metabolism (mainly methionine and cysteine metabolism), triggers an oxidative stress response and activate the retrograde pathway. The expression of genes encoding ribosomal proteins and proteins involved in the cell cycle was considerably lowered. In this study, we investigated the transcriptional response to potassium starvation using Serial Analysis of Gene Expression (SAGE)-tag sequencing. The expression of genes involved in several cellular processes was shown to be affected during potassium starvation including genes encoding proteins involved in stress response and phosphate metabolism. The effect of potassium starvation on the expression of PHO84 encoding an high affinity phosphate transporter was shown to be caused by an activation of the PHO84 promoter through the Pho4 transcription factor as well as at the level of RNA turnover. To further understand the mechanisms of ion homeostasis we analyzed the effects of potassium starvation on the genome-wide transcription in S. cerevisiae. In our studies we used the Translucent YNB medium containing very low concentrations of alkali metal cations, allowing controlled addition of potassium. Exponential growing cells in four independent cultures were transferred to medium containing 50 mM KCl or lacking KCl and grown for 60 min. RNA was isolated for transcriptome analysis. Recent technological developments made RNA sequencing the method of choice over analysis using DNA microarrays for such studies. We used SAGE tag sequencing allowing accurate quantification of RNA levels. The SAGE tags were aligned to a virtual tag library corresponding to all S. cerevisiae annotated open reading frames (http://www.yeastgenome.org) including 200 bp downstream sequences. In this way, transcriptional information was obtained for 6053 loci [see Additional file 1]. Comparison of transcript levels isolated from cells grown in media without potassium with those isolated from cells grown under standard potassium concentrations showed that the mRNA levels of 105 genes were significantly (P < 0.01) up-regulated more than 2.0-fold during potassium starvation and the mRNA levels of 172 genes significantly down-regulated. The 25 most up-regulated genes are shown in Table 1, the 25 most down-regulated genes in Table 2. Classification according to GO-term biological process using FunSpec  of the genes up-regulated at least 2-fold (P < 0.01) showed that the up-regulated genes belong to many different categories and that especially genes involved in phosphate metabolism, cytogamy and stress response are enriched in this set of genes (Table 3). In addition, genes involved carbohydrate metabolism are affected and genes subject to glucose repression like HXK1 are induced. Classification of the genes down-regulated at least 2-fold (P < 0.01) by potassium starvation shows a very clear enrichment of genes involved in cell cycle-related processes. In addition genes involved in ammonia assimilation and amino acid transport are enriched in this set of genes (Table 4). a, k: number of genes from the input cluster in given category; f: number of genes total in given category. Our SAGE-tag sequencing showed that the stress response genes HSP30, TPO2 and YRO2 were highly up-regulated upon potassium starvation, but due to the variation in expression in the individual cultures the effect did not meet our criteria for significance, i.e. P < 0.01. By real time qRT-PCR we verified the effects of potassium starvation on these genes, using ACT1 as control. As shown in Table 5 qRT-PCR clearly showed that HSP30, TPO2 and YRO2 were strongly up-regulated upon potassium starvation in agreement with the RNAseq data. As an additional control we verified the expression of GAP1 and ALG9 by qRT-PCR. Both by RNAseq and qRT-PCR we showed that GAP1 was strongly down-regulated whereas the control gene ALG9 was only slightly affected by potassium starvation (Table 5). a, down-regulation is indicated with ‘-‘. An obvious question is whether the up-regulated genes are required for growth at low potassium concentrations. To this end strains deleted for the most up-regulated genes or deleted for PHO4 (encoding a transcription factor regulating the expression of genes involved in phosphate metabolism, see below) were spotted on plates with 50 or 0.5 mM KCl. The trk1trk2 double disruptant, lacking the high affinity potassium transporters Trk1 and Trk2, was used as a control. None of the selected disruptants (Δssn8, Δcit3, Δhsp82, Δpdc5, Δpho84, Δspl2, Δhsp104, Δies5, Δpho4) showed an aberrant growth at 0.5 mM KCl, whereas the trk1trk2 mutant (BYT12) did not grow at this KCl concentration (Figure 1). These results indicate that the most up-regulated genes are not by themselves required for growth at low potassium concentrations. 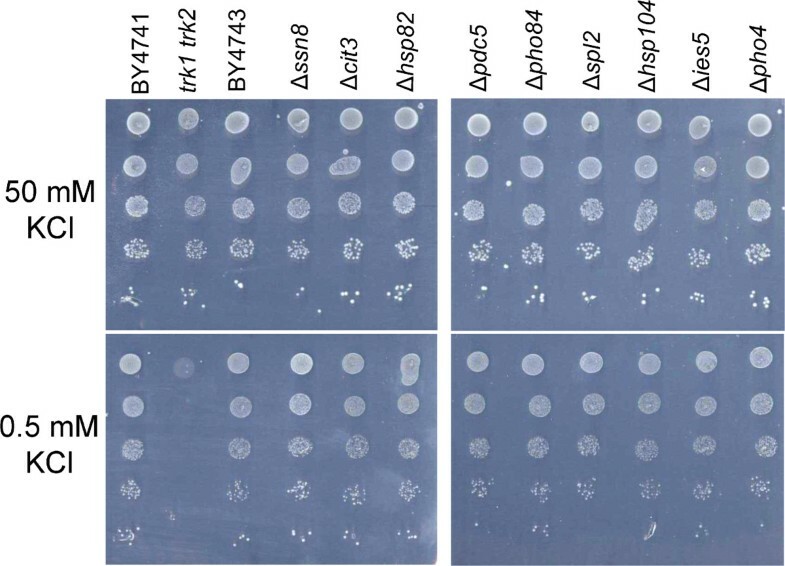 To study the survival of the tested disruption strains at low potassium conditions, these strains were spotted on a plate lacking potassium and after six days the cells were transferred to plates with 50 mM KCl. No significant differences in growth compared to the wild type strain were observed, except for the trk1 trk2 strain (data not shown). Growth at 50 and 0.5 mM KCl of deletion strains lacking genes highly up-regulated during potassium starvation or lacking PHO4 . Ten-fold serial dilutions of the indicated strains are spotted on Translucent YNB plates supplemented with histidine, methionine, leucine and uracil containing 50 or 0.5 mM KCl. Plates were incubated for 3 days at 30°C. Using the information available in the Yeastract database (http://www.yeastract.com) it became clear that many different transcription factors are associated with the up-regulated genes. This suggests that the transcriptional response to potassium starvation is not linked to the activation of a single transcription factor. Two of the up-regulated genes related to stress-response, i.e. YRO2 and TPO2, are also up-regulated upon weak acid stress . The latter up-regulation is dependent on the transcription factor Haa1. However, in a Δhaa1 mutant YRO2 is still highly up-regulated upon potassium starvation (RM Läkamp and GPH van Heusden, unpublished results) making a role of Haa1 in the response to potassium starvation less likely. To further analyze the regulation of YRO2 and TPO2 the promoter sequences were placed upstream of the bacterial ß-galactosidase gene in plasmid pRUL302 and introduced in yeast strain BY4741. The resulting strains were cultivated in the presence of 50 mM KCl till mid-exponential growth, transferred to media with 50 mM KCl or to media lacking KCl and grown for 60 min. Then, cells were isolated and ß-galactosidase activity was determined. Using 510 bp of sequences of the TPO2 promoter or 2141 bp of sequences of the YRO2 promoter we found an only 1.3-fold or 2.1-fold, respectively, increase in β-galactosidase activity upon potassium starvation, whereas RNAseq showed 4.6-fold (P = 0.025) and 23-fold (P = 0.075), respectively, increase in mRNA level, suggesting that also other mechanisms than activation of the promoter are involved in the expression of YRO2 and TPO2 during potassium starvation. Our RNAseq data reveal that genes involved in phosphate metabolism are well represented in the set of genes that were significantly up-regulated. Many of these genes, including PHO84, are strongly regulated in response to external phosphate concentrations (for review see: ). The transcription factor Pho4 translocates into the nucleus at low phosphate concentrations and plays a prominent role in activation of PHO84 expression . To investigate the involvement of Pho4 in the activation of the PHO84 promoter during potassium starvation we inserted 600 bp promoter sequences upstream of the ß-galactosidase gene in plasmid pRUL302 and introduced the resulting plasmid in BY4741 and the Δpho4 disruptant in the BY4741 background (each containing the pRS313 plasmid). The resulting strains were cultivated as described above to determine the effect of potassium starvation on the PHO84 promoter. As shown in Table 6, in the wild type background (BY4741) there is a clear activation of the PHO84 promoter, whereas in the Δpho4 strain hardly any activity can be detected, both after cultivation at 50 mM and 0 mM KCl. Introduction of an intact copy of PHO4 (pRS313[PHO4]) in the wild type background gives a stimulation of the PHO84 promoter, both at 50 and 0 mM KCl. Introduction of an intact copy of PHO4 (pRS313[PHO4]) in the Δpho4 strain restores and activates the PHO84 promoter. These results indicate that the Pho4 transcription factor is required for the expression of PHO84 at low potassium concentrations. Results of a typical experiment are given. In each experiment two independent transformants were analyzed, the average is shown. To further investigate the regulation of gene expression during potassium starvation we replaced the promoter sequences of a number of genes (HSP30, TPO2, YRO2, PHO84 and ALG9) by the CYC1 promoter. This promoter is most likely not influenced by potassium starvation as the levels of CYC1 RNA were hardly changed (1.2-fold lower levels after potassium starvation). The resulting strains were cultivated as above and RNA was isolated. Gene expression was determined by qRT-PCR using ACT1 as a reference gene. In this way we found the following effects of potassium starvation on the RNA levels: HSP30, 0.9- and 1.3-fold increase in two independent experiments; TPO2, 0.8- and 2.2-fold increase; YRO2, 5.3- and 3.5-fold decrease; PHO84, 6.8- and 8.6--fold increase; ALG9 (reference gene), 1.0- and 1.2-fold increase. These observations show that especially for PHO84 other regulatory aspects are involved besides activation of the promoter. Surprisingly, the levels of YRO2 RNA are reduced at 0 mM KCl. Several studies have shown that PHO84 is also transcribed in the opposite direction yielding antisense RNA [27, 28]. SAGE tag sequencing is able to identify antisense transcripts [29, 30]. This is illustrated for PHO84 in Figure 2A. Alignment of the sequenced tags to the complementary strand of the S. cerevisiae open reading frames (+ 200 bp downstream sequences) reveals potential antisense transcripts corresponding to 5665 loci [see Additional file 2]. The total number of tags aligning to the complementary strand is 4 to 14 percent of the total number of tags aligning to the coding strand. Comparison of the antisense transcript levels in cells grown in medium without potassium with the levels in cells grown under standard potassium concentrations shows that antisense transcription of 34 genes was significantly (P < 0.01) up-regulated more than 2-fold, whereas antisense transcripts of 76 genes were significantly down-regulated [see Additional file 3]. Several tags aligned to the complementary strand of PHO84. Almost all tags were found at a higher level using RNA isolated from cells grown at 0 mM KCl compared to cells grown at 50 mM KCl [see Additional file 3]. The total number of tags corresponding to antisense transcripts of the PHO84 gene is 8.7-fold (P = 0.07) increased after potassium starvation. Antisense transcription of PHO84 . A, scheme showing the position of SAGE tags corresponding to sense and antisense transcripts. B, primers used to detect PHO84 antisense transcripts. C. Detection of antisense transcripts using strand specific cDNA synthesis and PCR. RNA was isolated from cells grown for 60 min in Translucent YNB medium lacking potassium. Arrow indicates the position of the expected PCR fragment. Antisense PHO84 transcripts were further analyzed by RT-PCR using strand specific primers. cDNA synthesis using a primer specific for antisense RNA (primer AS-cDNA, Figure 2B) yields cDNA dependent on antisense transcripts. Using primers AS-PCR-Fw and AS-PCR-Rv (Figure 2B) this cDNA can be detected by PCR. As shown in Figure 2C (lanes 3 and 4) the expected PCR fragment was found. This band was not found when primer SE-cDNA (Figure 2B, lane 5 and 6) was used as primer for cDNA synthesis, which generates cDNA corresponding to sense transcripts. These results indicate that antisense PHO84 RNA can be detected RT-PCR, in agreement with our RNAseq experiments and previous studies. The yeast S. cerevisiae is an excellent organism to study fundamental aspects of cation homeostasis. Although many components involved in the maintenance of cation homeostasis in this yeast have already been revealed, still many aspects remain unclear. Understanding the response of yeast cells to potassium starvation is essential for understanding the mechanisms involved in cation homeostasis. Therefore, the Translucent consortium developed a new medium, based on the widely used YNB-medium, containing negligible amounts of alkali metal cations . This medium allowed potassium starvation studies. Studies have been conducted to address effects at the transcriptional  and proteomic level . Using DNA microarrays it was shown that the lack of potassium affects the expression of more than one thousand genes including a strong activation of genes involved in sulfur metabolism, oxidative stress response and the retrograde pathway and a reduced expression of genes involved in ribosome biogenesis and cell cycle control. At the protein level a general decrease in protein content and an increased level of stress-related proteins were found. In this study we used SAGE-tag sequencing to analyze the transcriptional response of S. cerevisiae to potassium starvation. We used four independent biological replicates and for reasons unknown the variation between these replicates is somewhat larger than expected. Despite this variation, similarly to the study with DNA microarrays we found a very pronounced effect of potassium starvation on gene expression and the expression of genes belonging to many functional categories was affected. The power of SAGE-tag sequencing is that also lowly expressed genes can be analyzed. Therefore, we were able to obtain information on the expression of 6053 different loci, much higher than what can be achieved by DNA microarrays. Both in this study and in the study with DNA microarrays a strong up-regulation of genes involved in stress response and a strong down-regulation of genes involved in various aspects of cell cycle control were found. Although the overall trend found in this and the previous study is very similar, also quantitative differences were found. One of the examples is the effect on the expression of genes involved in sulfur metabolism. In the previous study after 60 min of potassium starvation SUL2, MUP3, MET3, STR3, MET14, MET28, SER3 and MET10 were all up-regulated more than 4-fold. For these genes we also found up-regulation, although much less pronounced. The effect of potassium starvation on the S. cerevisiae transcriptome has also been investigated using chemostat cultures . In that study, only a limited number of genes were strongly affected by potassium limitation, and the great majority of these were genes known to be involved in nitrogen metabolism. Genes encoding ammonium ion and amino acid transporters (MEP2 and GAP1) were down-regulated 30-fold and virtually all other nitrogen catabolite-repressed genes were strongly down-regulated as well. SPS-regulated amino acid permeases were strongly up-regulated. In our study we also found a strong down-regulation of GAP1 and MEP2 (9.6 and 7.4-fold, respectively). On the other hand, in our study genes encoding amino acid permeases were down-regulated instead of up-regulated (GNP1 5.5-fold, DIP1 2.6-fold, TAT2 1.1-fold, AGP1 9.8-fold, PTR2 3.0-fold, BAP2 3.5-fold and MUP1 1.3-fold-down-regulated, see Additional file 1). In this respect it has to be mentioned that the physiological state of yeast cells in chemostat cultures can be greatly different from that of cells in shake flask cultures and that different media were used in the two studies. Potassium homeostasis is regulated by a complex interplay between transporters and regulatory proteins. Many proteins have been identified that bind to the various S. cerevisiae ion transports  (http://www.yeastgenome.org). The function of most of these interactions is still unknown and a role in the regulation of the ion transporters is imaginable. In Figure 3 a number of S. cerevisiae ion transporters and their binding partners is shown and the effect of potassium starvation on their transcript levels is indicated in a color scale, with down-regulation in green and up-regulation in red. It is clear that the RNA levels of some binding partners are increased and of some binding partners decreased. For example, HSP30, encoding a Nha1 binding partner, and ARR3, encoding an Ena2 binding partners are strongly up-regulated. The RNA levels of many, but not all, of the binding partners of the Nhx1 transporter are decreased. However, the significance of these observations still has to be shown. The effect of potassium starvation on the RNA level of a number of S. cerevisiae ion transporters and their binding partners. Protein binding partners (physical interactions) were taken from http://www.yeastgenome.org. Squares: ion transporters; circles: binding partners. Fold changes in RNA levels are indicated in a color scale, down-regulation in green and up-regulation in red; pink, RNAseq data not available. Protein-protein interactions are shown with blue lines. The figure was made using Cytoscape . Identification of transcription factors involved in the regulation of gene expression during potassium starvation is very complex. Using the information on transcription factor associations in the Yeastract database (http://www.yeastract.com) many different transcription factors were found associated with the up- or down-regulated genes. The transcription factor Pho4 may participate in gene regulation during potassium starvation. This transcription factor is found to be associated with seven of the 25 most up-regulated genes, i.e. ARE2, FUS1, HSP104, PHM6, PHO84, SPL2 and YNL146W (http://www.yeastract.com). Deletion of PHO4 strongly affected the activity of PHO84 promoter. However, other transcription factors are most likely be involved as well. In addition, RNA turnover is important. After replacement of the PHO84 promoter by the CYC1 promoter PHO84 RNA levels are still approximately five-fold increased. In this study as well as in the study using DNA microarrays  a strong induction if genes involved in phosphate metabolism, including PHO84, was found. Thus, despite the presence of phosphate in the medium, these genes are not repressed, when potassium is absent. The transcription factor Pho4 plays a key role in the regulation of these genes. The subcellular localization of this transcription factor is regulated via phosphorylation by the Pho80-Pho85 cyclin-kinase complex . When phosphate is available Pho4 is retained in the cytoplasm, whereas under phosphate limiting conditions it translocates into the nucleus, resulting in expression of genes involved in phosphate uptake. During potassium starvation we observed an increase in nuclear Pho4-GFP (data not shown). The expression of PHO4, PHO80 and PHO85 is only slightly and not significantly affected by potassium starvation (1.14-, 0.58- and 0.94-fold, respectively) [see Additional file 1], suggesting that transcriptional regulation of these genes does not play a role. However, the mechanism of the regulation of Pho4 during potassium starvation still has to be revealed. Several studies have shown that PHO84 is also transcribed in the opposite direction yielding antisense RNA [27, 28]. This antisense RNA induces transcriptional silencing of PHO84 via histone deacetylation of the PHO84 promoter when phosphate is available. Our SAGE tag sequencing revealed many tags corresponding to antisense transcripts corresponding to 5665 loci [see Additional file 2] and the levels of many of these tags were affected by potassium starvation, including those of PHO84 [see Additional files 2 and 3]. By applying SAGE tag sequencing, tags corresponding to antisense transcripts were also found in other studies [29, 30]. However, it has been suggested that spurious synthesis of second-strand cDNA during reverse transcription reactions triggers antisense artifacts . In our studies we performed cDNA synthesis on-the-bead making the formation of artifacts less likely . Furthermore, several studies showed the widespread occurrence of antisense transcription in S. cerevisiae (eg. [35, 36]). 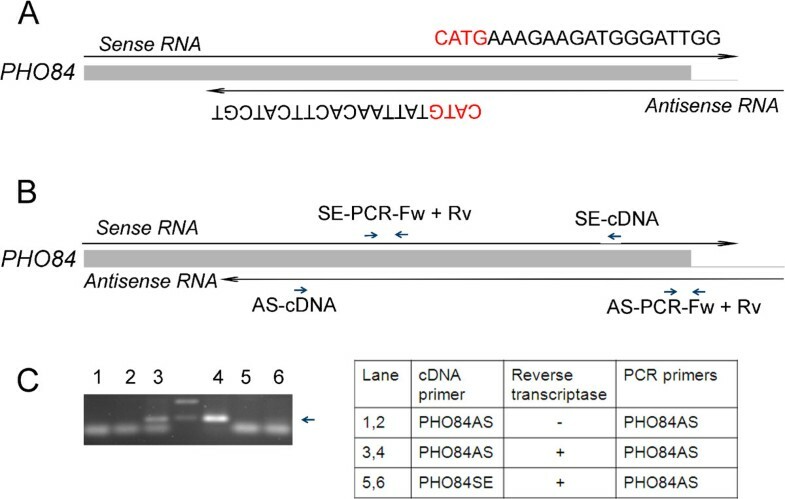 By RT-PCR using antisense-specific primers during cDNA synthesis we were able to provide additional evidence for antisense transcription of PHO84 (Figure 2). However, the role of antisense transcription in the regulation of PHO84 during potassium starvation still has to be disclosed. In this study the yeast strain BY4741 and strains derived from BY4741 were used, as listed in Table 7. For analysis of growth at low potassium concentrations also a number of homozygous diploid deletion strains in the BY4743 background were used, obtained from Euroscarf (Frankfurt, Germany). Yeast was grown in YPD medium or selective MY medium supplemented, if required, with histidine, leucine, methionine and/or uracil to a final concentration of 20 mg/L . For cultivation at defined potassium concentrations YNB medium containing very low concentrations of alkali metal cations, developed by the Translucent consortium, was used . Yeast transformations were performed using the LiAc method . Yeast strains carrying plasmids were obtained by transforming parental strains with the appropriate plasmids followed by selection for histidine, and/or uracil prototrophy. To replace the endogenous promoters of YRO2, HSP30, TPO2, PHO84 or ALG9 by the CYC1 promoter a DNA fragment was generated by PCR on plasmid pYM-N10  using the primer combinations YRO2-Fw-prom/YRO2-Rev-CYC1, HSP30-Fw-prom/HSP30-Rev-CYC1, TPO2-Fw-prom/TPO2-Rev-CYC1, PHO84-Fw-prom/PHO84-Rev-CYC1 or ALG9-Fw-prom/ALG9-Rev-CYC1, respectively. The primer sequences are shown in Table 8. These DNA fragments were used to transform BY4741 and transformants were selected on YPD plates containing 150 μg/ml G418. Correct integration was verified by PCR. Strain BY4741 was grown overnight at 30°C in Translucent YNB medium containing 50 mM KCl, supplemented with leucine, histidine, methionine and uracil. This culture was used to inoculate two times 50 ml of supplemented YNB medium containing 50 mM KCl yielding A600nm 0.1. These cultures were grown to A600nm 0.5 and cells were isolated by centrifugation. Cells from one culture were washed twice with supplemented YNB medium containing 50 mM KCl and resuspended in 50 ml supplemented YNB medium containing 50 mM KCl. Cells from the other culture were washed twice with supplemented YNB medium lacking KCl and resuspended in 50 ml supplemented YNB medium lacking KCl. Both cultures were incubated at 180 rpm at 30°C. After 60 min the cultures were poured into plastic tubes and immediately frozen in liquid nitrogen. Prior to RNA isolation, the frozen cultures were thawed on ice and cells were collected by centrifugation and transferred to Eppendorf tubes using ice-cold water. RNA was isolated using the Ambion RiboPure yeast RNA Purification Kit (Life Technologies). Sequence tags were prepared by the Leiden Genome Technology Center (Leiden, the Netherlands) as described . Briefly, 1 μg of total RNA was incubated with oligo-dT beads to capture the polyadenlyated RNA fraction. First- and second-strand cDNA synthesis was performed while the RNA was bound to the beads. While on the beads, samples were digested with NlaIII to retain a cDNA fragment from the most 3’ CATG to the poly(A)-tail. Subsequently, the GEX adapter 1 was ligated to the free 5’-end of the RNA, and a digestion with MmeI was performed, which cuts 17 bp downstream of the CATG site. At this point, the fragments detach from the beads. After dephosphorylation and phenol extraction, the GEX adapter 2 was ligated to the 3’-end of the tag. PCR amplification with 15 cycles using Phusion polymerase was performed with primers complementary to the adapter sequences to enrich the samples for the desired fragments. Sequencing was performed at the Leiden Genome Technology Center on Illumina Hiseq2000 sequencer (Illumina, San Diego, CA, USA). Sequence tags from six samples were bar-coded, mixed and analyzed in a single lane. Obtained sequences were aligned to a virtual tag library obtained by in silico digestion by NlaIII, cutting at 5’-CATG-3’, of S. cerevisiae sequences corresponding to open reading frames plus 200 bp downstream sequences using the CLC genomic workbench (Aarhus, Denmark). For each open reading frame the number of aligned reads per million was calculated. This was done independently for each biological replicate. Then, the average expression level with standard deviation was determined for each condition (0 or 50 mM KCl) using the four biological replicates. Statistical analysis was done using the Student’s t-test. The raw sequence data have been deposited in NCBI’s Gene Expression Omnibus (GEO) and is accessible through GEO Series accession number GSE57093. qRT-PCR was performed essentially as described earlier . Yeast strains were cultivated in Translucent YNB medium and RNA was isolated as described above. RNA (1 μg) was treated with DNase I (Ambion), according to the recommended protocol, with the addition of 0.5 μl RNasin (Promega) per reaction. From each sample, 0.5 μg was used for subsequent cDNA synthesis with the oligo-dT primer, using an iScript Select cDNA kit (BioRad). Several dilutions of this cDNA were prepared and qRT-PCR was performed in 25 μl reaction volumes using a standard PCR reaction mix for Phusion DNA polymerase (Thermo Scientific), with the addition of 1.25 μl 500× diluted SYBR Green (Life Technologies) in DMSO. PCR efficiency was determined using a series of dilutions of genomic BY4741 DNA. To measure transcript levels of PHO84, YRO2, TPO2, HSP30 and ALG9, primer combinations PHO84-qPCR-Fw/PHO84-qPCR-Rv, YRO2-qPCR-Fw/YRO2-qPCR-Rv, TPO2-qPCR-Fw/TPO2-qPCR-Rv, HSP30-qPCR-Fw /HSP30-qPCR-Rv and ALG9-qPCR-Fw/ALG9-qPCR-Rv, respectively, were used. Transcript levels were normalized against expression of the ACT1, measured using the primer combination ACT1-qPCR-Fw/ACT1-qPCR-Rv. Experiments were performed on a Chromo4 Real-Time PCR Detection system controlled by the Opticon Monitor 3.1 software (Biorad). Promoter activity was determined by fusion of selected promoter regions to the bacterial ß-galactosidase gene in plasmid pRUL302 as described . Promoter regions of PHO84, TPO2 and YRO2 were amplified by PCR on chromosomal DNA isolated from BY4741 using the primer combinations IGPf1/IGPr, IGpTf/IGpTr or IGpYf3/IGpYR, respectively, yielding fragments of 600, 510 and 2141 bp, respectively. These fragments were digested with BamH1 and EcoRI and ligated in pRUL302 digested with the same enzymes. These constructs were introduced in yeast and transformants were selected for uracil prototrophy. pRS313[PHO4] (pRUL1334), containing the PHO4 coding region and 578 bp upstream sequences and 500 bp downstream sequences was made by ligating a PCR fragment into pRS313  using the restriction enzymes EcoRI and BamHI. The PHO4 PCR fragment was obtained by PCR using primers IG-PHO4-Fw-EcoRI and IG-PHO4-Rv-BamHI with BY4741 genomic DNA as template. All PCR products were analyzed by DNA sequencing. Yeast strains carrying the various pRUL302 plasmids were grown in Translucent YNB medium supplemented with histidine, methionine and leucine as described above. Yeast cells were isolated from the frozen cultures after thawing and centrifugation and resuspendend in water. ß-Galactosidase activity was measured using the Yeast β-Galactosidase Assay Kit (Thermo Scientific). Strains were taken from the collection of systematic diploid homozygous deletion strains (Euroscarf, Germany) and were cultivated overnight in Translucent YNB medium supplemented with 50 mM KCl and histidine, uracil, leucine and methionine. Aliquots of these cultures were centrifuged and cells were washed twice with Translucent YNB medium lacking potassium and subsequently resuspended in Translucent YNB medium lacking potassium till A620 of 0.5. Ten-fold serial dilutions were made in the same medium and 10 μl aliquots were spotted on plates with Translucent YNB medium with different concentrations of KCl supplemented with histidine, uracil, leucine and methionine. As controls BY4741 and Δtrk1Δtrk2 in BY4741 were included. Plates were incubated at 30°C for 3 days. We would like to thank all members of the Translucent SYSMO project for the stimulating discussions and pleasant collaboration. We thank Henk Buermans (Leiden Genome Technology Center) for SAGE-tag sequencing. Marcel van Verk is acknowledged for his help in using the CLC genomic workbench software, Janneke Teunissen for her help in construction of plasmids and ß-galactosidase assays, Rianne Läkamp for her help in qRT-PCR experiments and Stefan Guirten for his help in studying deletion mutants at different potassium concentrations. This study was funded by the Netherlands Organization for Scientific Research (NWO) - Earth and Life Sciences (ALW) (SYSMO) - grants 826.06.004 and 826.09.006. IGA carried out most of the experiments and contributed to writing the manuscript; GPHvH designed the study, performed some experiments and prepared the manuscript. Both authors read and approved the final version of the manuscript.